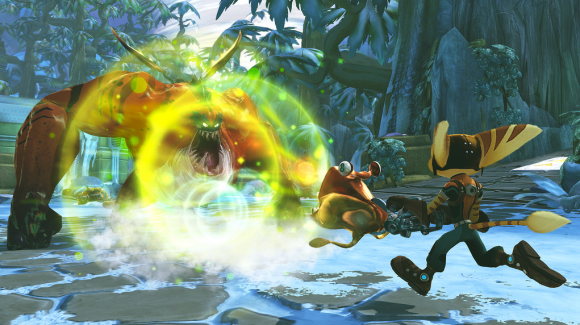 Ratchet & Clank: Full Frontal Assault is the latest game in Insomniac's Ratchet & Clank series. While previous entries have focused primarily on single-player run-and-gun action, Full Frontal Assault requires a bit more strategy and is a game that's best enjoyed with friends. Make no mistake, you're still smacking aliens in the face with your trust Omni-wrench, but Full Frontal Assault features several new gameplay systems that can take some getting used to and may seem out of place to series veterans. The story in Full Frontal Assault is almost non-existent: Ratchet and Clank are flying around space with Captain Quark, some bad stuff happens, and now you need to set things right. The game has you visiting different planets in order to restart their planetary defense systems—a task you'll accomplish by collecting weapons and shooting your way through countless swarms of enemies. When you land on a planet, you're given a base with six generators which you'll need to protect from attackers. Enemies will randomly attack your base in waves and if they destroy all of your generators, you'll fail the level. You can spend bolts (the game's currency) to buy mines, barriers, and turrets to help defend your generators—but I found them largely ineffective at keeping invaders away. Most enemies can easily tear through your defenses, leaving you scrambling back to base in order to fend off the advancing aliens. As enemies get tougher, you'll want to up your firepower with different weapons. Unlike previous Ratchet & Clank games, Full Frontal Assault doesn't let you purchase weapons or ammo—instead, you'll need to seek out "weapon pods" that have been dumped throughout the level. The pods are easy to find, and opening one lets you choose which weapon you'd like to receive. Once you've made your choice, the weapon pod shuts down and you'll need to find another one if you want a different gun. 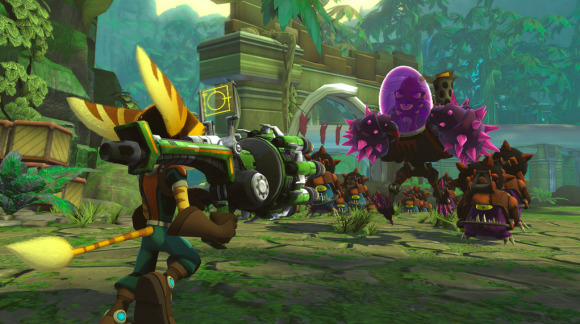 The wacky arsenal is admittedly a high point of all Ratchet & Clank games, and Full Frontal Assault is no exception: Weapons such as the high-powered Warmonger and the Groovitron (a bomb that makes enemies dance) will become available as your progress through planets and will increase in power the more you use them. Gathering weapons is key to keeping your generators intact, and it's fun trying out different weapon combos to see which fits your play style best. The character dialog that accompnaies all your running and gunning is well-written and genuinely funny at times, but you're given little incentive to find out what happens next. Resources like bolts and ammo are scarce, and the game can quickly turn tedious as you rush around the level smashing infinitely-spawning crates and enemies to get the supplies you need. There are only three planets, and you can probably finish the single-player campaign in about four hours—six, if you took your time to collect every weapon and golden bolt in each of the five missions. Full Frontal Assault's single-player may be a bit lacking, but its multiplayer aspects are where the game really shines. Full Frontal Assault lets you go through the main story campaign with a friend, making it easier to get through even the toughest waves of enemies. The local and online co-op opens up new strategies, and is infinitely more fun than playing the game solo. If you're sick of the campaign and want to try something new, the online competitive mode is reminiscent of the Defense of the Ancients (DotA) mod for Warcraft III: You and your enemy each have a base on opposite sides of the map, and your goal is to wipe out all of their generators before they wipe out yours. You can go around the map capturing nodes to earn weapons and bolts, the latter of which can be used to buy different types of troops to attack your opponent or defenses for your base. Choosing whether to mount an attack or fortify your base can mean the difference between winning and losing, so sometimes the overly-aggressive option isn't the best one. 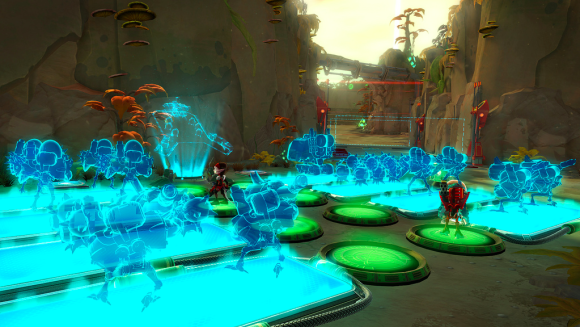 Ratchet & Clank: Full Frontal Assault is unlike any game in the series. The tower defense aspects are neat and the weapons are a blast to use, but the entire thing feels more like a Dungeon Defenders clone than it does a Ratchet & Clank game. Multiplayer is enjoyable, but it isn't enough to outweigh the lackluster single-player experience. If you're a die-hard fan of the series looking for a new adventure starring Ratchet and Clank et al, then Full Frontal Assault will be right up your alley. Me, I'm going to go back to playing the Ratchet & Clank HD collection instead. This story, "Ratchet & Clank: Full Frontal Assault review" was originally published by TechHive. Ratchet and Clank's latest adventure offers up great multiplayer gameplay and a nice variety of weapons, but lacks a compelling story.